Man has long had the power to take life, but what will happen when he learns to give it? Intrigued by this question, young Victor Frankenstein – a devoted student of science – becomes obsessed with the idea of conjuring life out of ‘lifeless matter’. Using his formidable skills in chemistry and other sciences, Victor begins to assemble a being from scavenged and stolen body parts. Once he has fathered a son created by his own science, Victor rejects the hideous creature he has brought to life. Eventually, the creature mounts a campaign of revenge against his creator, struggling to be recognised as a thinking, feeling being. 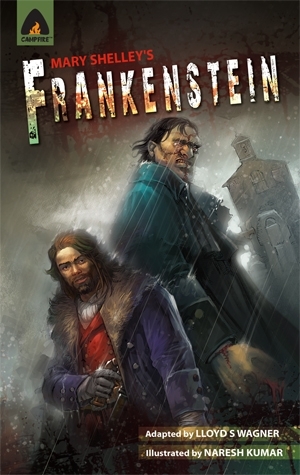 I’ve read the original of Frankenstein, but when it comes to remembering the story all I remember is the gist of it and a few other things, not the actual chronological storyline. I think that is also coloured by a lot of movie adaptations I’ve watched so I can’t really say if it’s a true to story adaptation or not. I believe it is, going from a very vague recollection, and I do remember some lines which have been used as well. Basically I’m reviewing the graphic novel for the graphic novel and not the original influence. There is one comparison I wish to make towards the original one though. The original bored me and annoyed me, even though I enjoy the story of Frankenstein, Mary Shelley’s novel did not do it for me. It doesn’t matter if I read the original or watch/read an adaptation though when it comes to my view of Victor Frankenstein because I always thought he was a nitwit. A moaning nitwit. And that Frankenstein’s monster was far more intelligent than his creator. Granted he turned to a life of murder because of being mishandled and that’s not necessarily an excuse, but I still feel he is far more intelligent than Victor. Victor angers me as a person because he goes about creating this creature only to immediately decide he is a monster because he is not aesthetically appealing to him. Some people might put that to metaphor or have some sort of explanation that it means more so than that, but really? When it comes down to it, his reaction is pretty instantaneous and it’s really pathetic. He does not know what is going on inside this creator. Does he try to communicate with it? Does he try to find out what it feels? No, he doesn’t. What a moron. And I think we can all learn something from that, in that if you judge someone by their looks or how they move, then you are a moron (sorry to go on, Victor Frankenstein infuriates me. I was going to cut that out or at least cut it down, but I thought I’d leave it there in case anyone else has an opinion on it). The reason I want to mention that is because in this graphic novel I still believe Victor is a nitwit and it shows to me that the monster is still far more intelligent, but it’s not painful in it’s delivery for me. The story is an engaging one and it’s delivered as such. I really liked how the panels were placed on some of the pages and in some scenes, I feel that added to the story. I am somewhat torn with the art because in some panels when the characters are further in the distance or smaller their features are ill defined and sometimes they don’t have much facial features, but then up close they are very well defined so I don’t know how to take that. On one hand it bothers me because I love a well defined face even if it is smaller. I think that is very important in all art. But on the other hand I feel it is very artistic because the faces are well defined up close when they are larger and the art is reminiscent of water colours to me. It’s reminiscent of water colours and impressionism to a degree, a small degree, but it’s there. Other than that I rather enjoyed it, not just for the story, but for the small touches as well. In the beginning you get introduced to the characters with a full page dedicated to them, then there is an explanation of what Scarlet Fever is when it is mentioned, and I like the inclusion of Crypt Capers in the back. Crypt Capers shares information on body snatchers and what was going on with medical science in the 19th century when procuring bodies for dissection was big business. You can find this graphic novel, amongst all their others, on their website. The banner and the link further below will take you there.